Rapitank is a light weight, modular temporary tanking system that’s versatile enough to create a holding tank of any dimension or shape. Being made of a PVC coated canvas material it is extremely light weight and durable. The material is protected with an anti-UV and anti-fungicidal properties. The specification of this material can vary depending on the application and the industry standards to accommodate that application. tank is then simply "pulled" up and into position when needed. With no requirement for any form of hard ground core the Rapitank can be installed on any ground surface including grass, for applications such as temporary water / sewage storage. It can be used as temporary holding tank to be used when more permanent holding tanks need to repaired, replaced or have an increase in capacity. It is incredibly flexible in the uses it has. 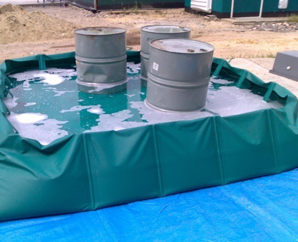 The Rapitank system is fitted with a sealed ground sheet that effectively holds liquids within a sealed containment structure. 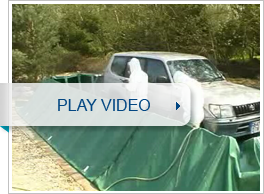 This is ideal for military vehicle decontamination purposes. Integral connections points are welded into the structure as standard, to allow for either draining or filling. The size and position of these connection points can be fitted to suit any specific client requirements. The Rapitank can be supplied with a lid to prevent evaporation or contamination if required.